For all 50 hotels with SPA and wellness center in Berlin, we show actual room availability. An access to a wellness/spa center may not be included in the room rate, please check the hotel booking conditions. We should definitely note that it is quite difficult to find a real restaurant with national cuisine in Berlin. If you want to find really traditional food, we suggest going to local pubs and bars. Besides best varieties of high quality drinks guests can enjoy excellent meat dishes and homemade sausages. Tourists traditionally like such dishes as homemade Klops meatballs and Kotelett steak cooked according to a special recipe. Potato salad is a wonderful choice as a garnish for meat dishes. You shouldn’t think that such menu will be liked by men only. Women also show their affection, and have their own preferences, for example, white beer. The main difference from the ordinary beer is in fruit flavored syrup that is added by bartenders. Tourists, who enjoy more complex and delicious dishes, should try deep fried chicken and Eintopf soup. The last meal consists of numerous components and it more looks like a stew rather than a soup, which is a usual dish for Europeans. 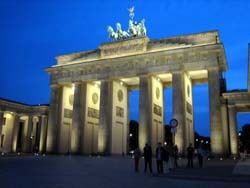 OrangeSmile.com offers 50 hotels with wellness center facilities in Berlin. Book the right SPA-hotel with us and make your leisure stay in Berlin cheap, wealthy and healthy!